Headliners Chorus- WHO ARE WE? The Headliners Chorus sings a cappella in four part harmony, focusing on entertaining our audience. With an extensive repertoire, we sing a variety of genres from jazz, swing, rock and pop to show tunes. We strive to keep a high community profile by contributing our time and talents to local events, and always welcome an opportunity to share our music. 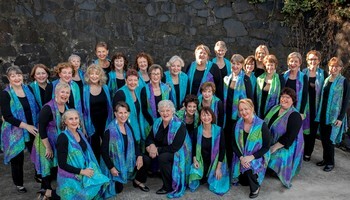 We are members of Sweet Adelines Australia, part of Sweet Adelines International. Our Chorus is one of 35 nationwide which incorporates a membership of over 1400 women. All of our rehearsals are open to the public and to potential new members, so why not pay us a visit. Want Headliners Chorus to sing at your next function? Why not hire Headliners Chorus to entertain at your next event? We can perform at corporate functions, charity events, community entertainment events, birthday parties, christmas parties, awards nights, weddings, engagements, anniversaries, and even funerals/memorial services.